It's time for another edition of Seven Things Tuesday! I mentioned last week that our Garmin had an unfortunate accident. Luckily, it was still under warranty and we were able to have it repaired or replaced for a small fee. We sent it out right away and thankfully it is on its way here! Hopefully it will arrive before the end of the week. Mike and I are already registered for the Stockade-athon 15K in Schenectady, New York on November 13th, but we have some other possible races to add to the rest of this year's race schedule. On November 5th there is the East Avenue Grocery 5K Run. Even though it is the week before the Stockade-athon we should be alright, right? But, then I found the Southeast Family YMCA Annual Turkey Classic 5 Mile Race on November 20th. I would rather do this one because I want to run a sub-50 minute race! Finally, we are definitely doing the It's a Wonderful Run 5K race in Seneca Falls, New York on December 10th! This should be really fun because you run through the town of Seneca Falls all lit up at night. 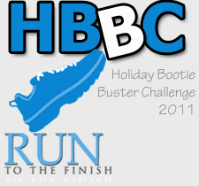 Yesterday while browsing some other running blogs, I noticed Amanda's Holiday Bootie Buster Challenge. I decided to sign up because it seems like a lot of fun! You get points for different activities that you do, for example, you get one point per mile that you run. The challenge runs from November 19th to January 6th and there are possibilities to win some amazing prizes. If you want something fun to help you commit to working out during the holiday season you should consider signing up! We are five days away from our very first half marathon! This weekend's race (recap will be done tomorrow, with or without race photos) helped me believe in myself even more. I know that I am going to crush this half marathon. I'm sure consultation with the great McMillan Running Calculator will be happening soon. On Sunday, Mike and I went to Target and Marshalls to buy some new winter running clothes. I bought two pairs of pants, two long sleeve shirts and one jacket. I can't wait to try them out! Mike also bought a pair of pants and one long sleeve shirt. On Saturday after our race we went out to dinner with some of Mike's relatives. His cousin was in Rochester playing in a volleyball tournament and his aunt and uncle made the trip from California to come watch her play. His other uncle and grandparents came to watch too. We didn't go see her play but we did get to go out to dinner at Mario's with his relatives, minus his cousin (she had to go out to dinner with her team). It was a lot of fun and we even got all of the leftovers because no one had a refrigerator in their hotel room. I finished the last of the leftovers this afternoon for lunch! 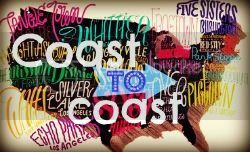 I can't believe we are in our last week of half marathon training! It is officially taper week and tonight's run only called for four miles. I mapped out a 4.1 mile route while I was at work and when we both got home we headed right back out to run. Overall the run went pretty well. The route that I decided on combined roads that we have already run on and others that we hadn't yet. That may have been one reason why we went down the wrong road and after that happened we were afraid that we wouldn't get our 4 miles done. We finished up the rest of the run and added a little bit extra at the end. Mike mapped our route when we got home and we did exactly 4 miles! Our total time was 42:23, which is 10:35 pace. I had some stomach issues on this run, but I don't think it held back the pace too much. Maybe the leftover eggplant parmigiana from Mario's caused the problem. Good luck with your first half! It will be amazing. Will you have your garmin back by then? And I am now tempted to do the grocery run 5k. I might be able to convince my bfriend to drive me up to Rochester for the run. I just got some cold weather tights and haven't had to use them yet (YAY!!) it has been fairly warm so I am still running in shorts!! Rena - Thanks! If you do end up doing it let me know, we still haven't decided which races we want to do. I'm not sure if we will have the Garmin, but even if we do Mike will wear it (since I'm nice haha). Mom - I was wondering when your Nuun was going to come in, too bad it is on back order! Eating out at any Italian restaurant always sets my stomach off. At least it's not the day of the race. Just got an update on it...it has shipped I am psyched!! Also before my run today I tried the Cliff Gel in Razz flavor...it tasted really good but it didn't sit well in my stomach... I have to take half and drink some water then take half and drink more water...too much at once but it was yummy not sure it did anything but I ran 9 miles in the wind and then rain so....maybe next time I might see better results!! !